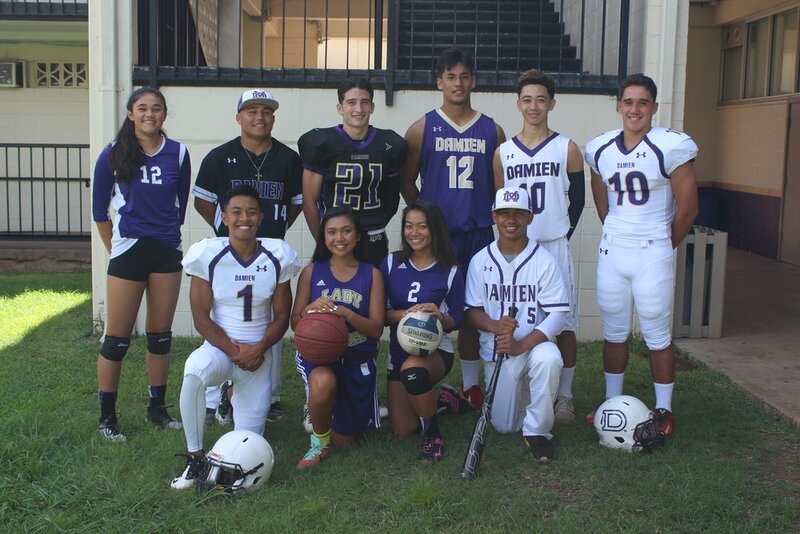 The Damien Athletic department strives to create a safe and enjoyable environment for our over 60 sports’ teams that focuses on pride, unity and integrity. We consider athletics an integral part of an educational environment and believe that participation in sports develops a healthy, well-rounded student. Physical fitness, discipline, and personal sacrifice promotes success in the classroom. While we strive to build competitive, successful teams, our primary goal is to make our student-athlete’s successful in the classroom and on the field of play and guide them to become caring and positive contributors to the community. To cultivate and maintain an atmosphere of spiritual growth, lifelong learning, solidarity with the underprivileged and poor, ethical behavior, and awareness of environmental issues. on and off the playing field. To continuously find ways to improve our programs to ensure a positive and nurturing experience for our student-athletes. To endorse learning and professional development of our Athletic staff to enhance the student-athlete’s knowledge, skills and performance levels in efforts to achieve the highest level of success. To maintain open and effective communication among our student-athletes, athletic department, faculty & staff, parents, administrators, and community. To continue to integrate best practices into all phases of the athletic educational process. To ensure that student-athletes and staff have a safe place to learn, work and compete.